Son Of Flicka was beaten just a neck at last year’s Festival when runner-up to Sir Des Champs in the Martin Pipe Conditional Jockeys’ Hurdle but he went one better today with victory in the Coral Cup, romping home to a three-and-a-half length victory over top-weight Get Me Out Of Here. The winner was backed in from 66/1 to 16/1 after being tipped by the Racing Post’s Pricewise column. Trainer Donald McCain, who was celebrating his second win at this year’s Festival after yesterday’s success of Cinders And Ashes, said: “He’s a tough little horse and he always does his best. He was going up and up in the weights and never winning a race but he’s always deserved a big one. “He’s been around for a long time - he’s lived with us since he was a three-year-old and I was devastated for him last year when he got done on the line. Then he took a terrible fall at Aintree and it took a while to get his confidence back and he’s been running on bad ground which isn’t his thing. We aimed to come here and try to have him spot-on for the day. “You come here and there are 15 or 20 with chances so I’m never confident. I know my good horses but in the handicaps I’m a little bit lost, but he’s as tough and as genuine as they come and I’ve got a jockey who’s riding out of his skin. The stewards subsequently considered the improved form of Son Of Flicka following his previous run at Kempton and were satisfied with McCain’s explanation that the gelding appreciated the better ground and comes to himself in the spring. Jason Maguire, the winning rider, said: “It’s a great training performance by Donald McCain to get this horse back. He’s been disappointing on his last few runs and he has obviously come down in the handicap. Donald’s got him cherry-ripe today. Phil Williams, the man behind owner Twenty Four Seven Recruitment, commented: “It’s one of the greatest feelings that I have ever had. He came second last year and the horse is such a great little thing. “I love the horse and, for me, it’s all about the best for him - I almost feel like retiring him now because he owes me nothing. “Michael O’Leary beat us last year and, when you are second here, it’s a lonely place. I said to him that it must have been the first time I know that he has ever organised anything to turn up in the right place at the right time, in a nice way. I admire the man really - he is a great sport and he wished me all the best. “Son Of Flicka ran up the hill last year and we were beaten by something that was just brilliant. Today, he has had his day. “If you can just please make sure that you step over me when you come to work in the morning, I would be very grateful. I am going to write my name and address somewhere so I can be sent home. If you want to find the Jonjo O’Neill-trained Get Me Out Of Here at The Festival look no further than the runner-up spot. Three times the horse has run at Jump racing’s premier meeting, and each time he has finished second. 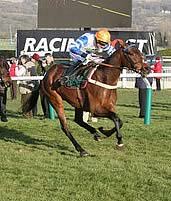 Today that was three and a half lengths second to Son Of Flicka in the Coral Cup. Earlier visits to The Festival had resulted in the runner-up slot in the William Hill Supreme Novices’ Hurdle and Vincent O’Brien County Hurdle. O’Neill, who trains the eight-year-old for owner J P McManus, said: “All being well he’ll come back here next year and I’ll be delighted with another second. “He’s been great to us and he’s run a blinder again today. We all knew it would be hard to win under top-weight. “We’re disappointed for him, but it’s great to get him here in one piece three years in a row. A P [McCoy] gave him a brilliant ride and everything went right so we have no excuses. He stayed the trip well enough. Nicky Henderson ran two in the race - Spirit River who fell at the last when in contention for a place, and Veiled, who took third. Featherbed Lane sustained a broken leg during the Coral Cup and was humanely put down.